Margaret Fiennes, 11th Lady Dacre with her husband Sampson Lennard from Hon. Thomas Barrett-Lennard’s “An Account of the Families of Lennard and Barrett,” 1908. Margaret Fiennes (or Fynes), 11th Baroness Dacre of the South (1541 – 16 March 1612) was a suo jure peeress having been created Baroness Dacre by King James I of England in 1604. She was the daughter of Thomas Fiennes, 9th Baron Dacre who was executed for murder in the year of her birth. His title and lands, upon his death, were forfeited to the crown. The title would not return to the family until her brother was restored in 1558 by Elizabeth I.
Thomas Fiennes, 9th Baron Dacre, father to Lady Dacre. 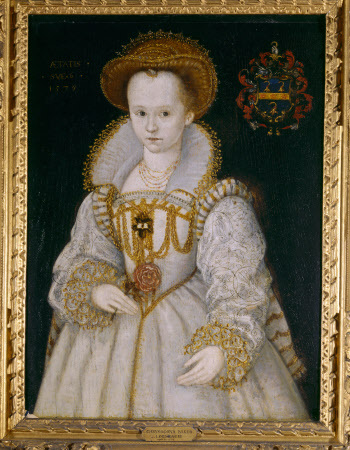 Lady Dacre was born in 1541, the youngest child and only daughter of Thomas Fiennes, 9th Baron Dacre and Mary Nevill, daughter of the 5th Baron Bergavenny. In the year of her birth, her father was hanged for the murder of a gamekeeper by the order of King Henry VIII, and his lands and title were forfeited to the crown. 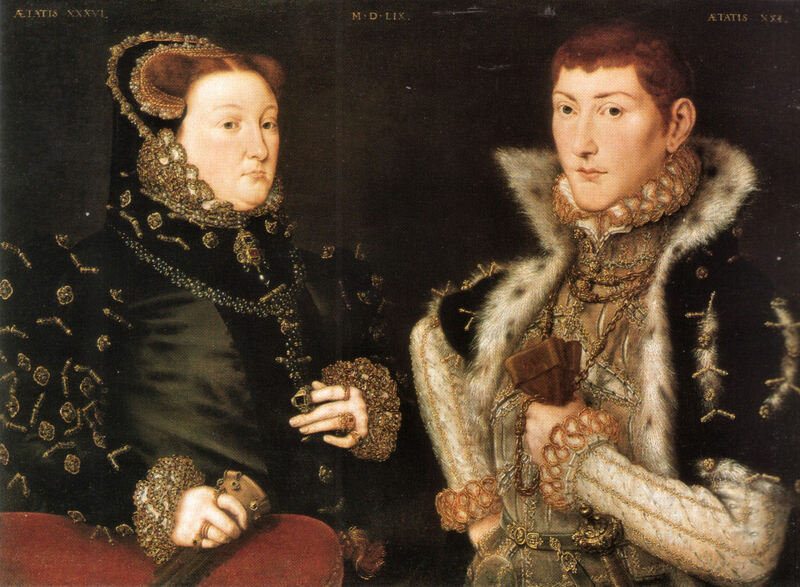 Lady Dacre’s brother, Gregory Fiennes, would become the 10th Baron Dacre upon the ascension of Elizabeth I in 1558. The 10th Baron married to Anne Sackville, cousin to Queen Anne Boleyn; they had one daughter who died young. Upon his death, the barony went into abeyance until it was revived for Margaret under James I of England. 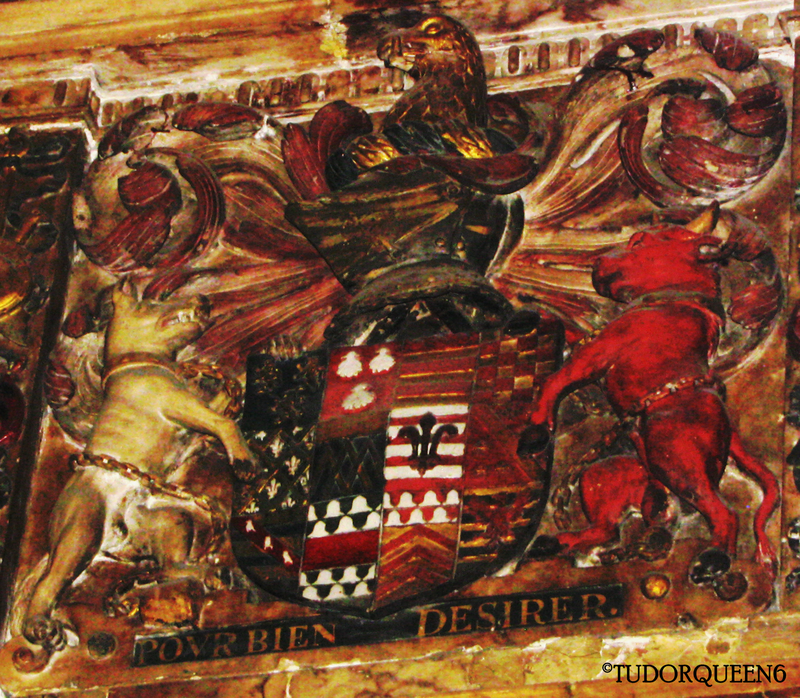 Coat of arms of Gregory Fiennes, 10th Baron Dacre of the South from his tomb in Chelsea Church, London. Lady Dacre was related to three of Henry VIII’s six queens. Her paternal great-grandparents were Thomas Fiennes, 8th Baron Dacre and Anne Bourchier. Anne Bourchier was the uterine half-sister of Lady Elizabeth Howard (mother of Queen Anne Boleyn) and Lord Edmund Howard (father of Queen Katherine Howard). 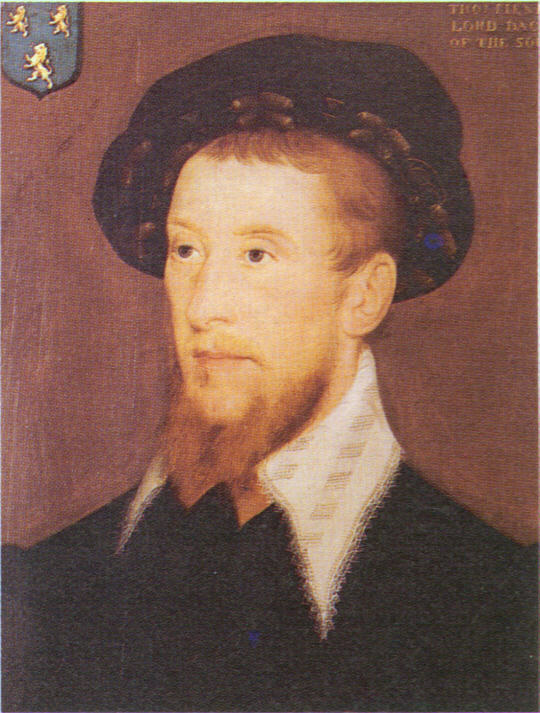 Lady Dacre’s father, the cousin of Queen Katherine Howard, was executed in 1541 despite her position as queen. The Parr’s shared several connections. Firstly, Fiennes’s great-grandfather, Thomas, 8th Baron Dacre was the first cousin of Sir Thomas Parr of Kendal, father of Queen Katherine Parr. Their mothers, Alice Fiennes (FitzHugh) and Elizabeth Parr/Vaux (FitzHugh) were sisters; both daughters of Sir Henry FitzHugh, 5th Baron FitzHugh and Lady Alice Neville (sister of Warwick, the Kingmaker). The Parr’s also shared the Woodville connection of Mary Neville, Lady Dacre’s great-grandmother, Katherine Woodville, Duchess of Buckingham. Anne Boleyn (wife no. 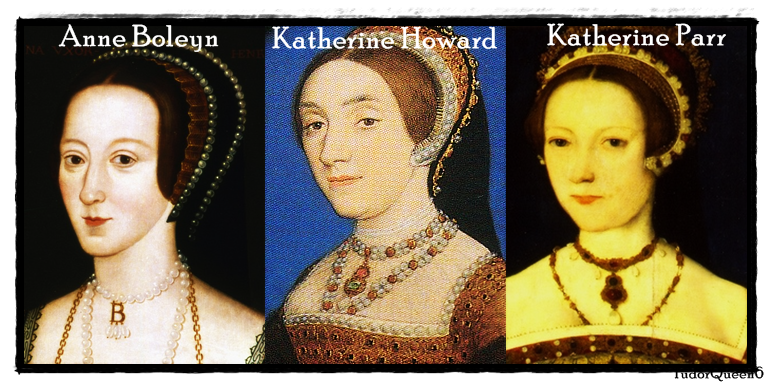 2), Katherine Howard (wife no. 5), and Katherine Parr (wife no. 6) were all cousins to Lady Dacre. John Lennard, born 1567; buried 10 Oct 1575. Sir Henry Lennard, 12th Baron Dacre (25 March 1570 – 8 August 1616); Born in Chevening, Kent, England; married Chrysogona Baker, by whom he had issue. 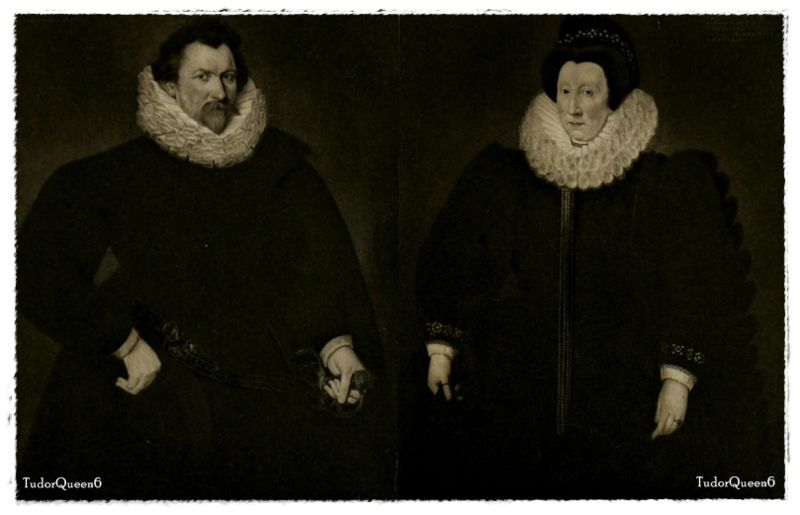 Anne Lennard, born 1 Aug 1572 Chevening, Kent; married Herbert Morley. Elizabeth Lennard, born 5 Jun 1580; buried 20 Oct 1581. Elizabeth Lennard, born 26 Nov 1581; married Sir Francis Barnham, by whom she had issue. Gregory “George” Lennard, born 25 Oct 1573Chevening, Kent; married in 1614 to Maud Llewellyn. Died 1620, without issue. Mary Lennard, born 22 Oct 1574 Chevening, Kent; married Sir Ralph Bosville. Thomas Lennard, died 1638 without issue (d.s.p). He is NOT the ancestor to the “Leonards” of Taunton and Bridgewater in America. Margaret Lennard, born 28 Sep 1578; married Sir Thomas Waller, by whom she had issue, including Parliamentarian soldier Sir William Waller. John Lennard, born 11 Oct 1584; died bef. 1615. The title of Baron Dacre had been restored to Margaret’s brother Gregory by Queen Elizabeth I shortly after her ascension to the throne; however upon his death in 1594, it had once again lapsed in abeyance. On 8 December 1604, King James I created her suo jure Baroness Dacre, and she held this title until her death on 16 March 1612. She was succeeded by her eldest son, Henry. This entry was posted in Life as Queen (1543-1547), The Family of Katherine Parr, The Tudors (1485-1603) and tagged 11th baroness dacre, barony dacre, dacre of the south, lady dacre, margaret fiennes, sampson lennard, suo jure baroness by tudorqueen6. Bookmark the permalink. Wish I had found out that Thomas in America was not the Thomas son of Sampson and Margaret sooner. Would have save me about 20 hours of searching! Back to the drawing board! Yeah, it’s rather frustrating when you can’t find sources. That’s why I do some of these articles. Good luck! Glad to see you don’t copy the works of others. Glad to see you kept Thomas in England. Thanks! I do genealogy as well. I wanted to make sure of the connection between the Lennard of England and America. I found that it was not possible and was obviously fabricated.